Port Stephens' haunted maritime past. The rugged and wild coastline of Port Stephens is known as the ‘ship wreck coast’ and is a haven for divers and photographers alike. 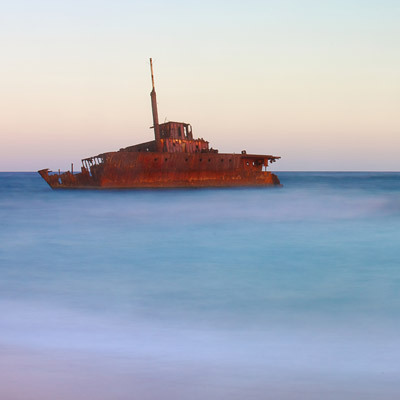 One of the most well known ship wrecks at Port Stephens is the Sygna, resting on Stockton Beach. During May 1974 the NSW coast was being battered by large storms which brought heavy swells to both Sydney and Newcastle ports. Newcastle port reported a swell of over 17 meters at the entrance. The Sygna was on her maiden voyage, with a load of 50,000 tonnes of coal destined for Europe at the time of the accident. She was anchored four km off Newcastle when the Bureau of Meteorology issued a storm warning and directive for ships to move out to sea. Seven of the ten ships anchored off Newcastle did so, however the Sygna was not one of them. Early the following morning with wind gusting at 165km/h, the captain issued orders to move set sail. Unfortunately even with her engines at full-ahead she was unable to make any headway, and the storm turned her parallel to the beach. It is reported with in 30 minutes she had run aground on Stockton Beach. With heavy seas pounding the stricken ship her captain radioed a Mayday and gave the order to abandon ship, A Iroquois helicopter from RAAF Williamtown’s Search and Rescue (SAR) Squadron flown by Flt Lt Gary McFarlane, attended the scene and slowly rescued the 31 trapped sailors from the wreckage, in near cyclone conditions. Fortunately no one was injured of killed in the incident. Gary McFarlane was awarded the Air Force Cross (AFC), with other members of his crew receiving commendations, for their heroic efforts during the rescue. Over the last 30 years the ship has slowly been decaying from the harsh elements in its environment, However it remains as an icon and landmark for the local area. Explore the remains of some of the most fascinating wrecks on Australia's rugged coastline.